NOTE: Although IDL sofware is provided as part of this HLSP, it is done so "as-is". MAST does not support or update this HLSP software to account for changes to IDL, operating system architectures, etc. Users are encouraged to provide updated versions of this HLSP software to MAST or the Astronomy Source Code Library (ASCL) for the benefit of the at-large community. Data products can be found here. There are two "data delivery" subdirectories: "dd1/" (Cycles 7/7N) and "dd2/" (Cycles 11-16). We recommend using "wget" or "curl" scripts if you want to retrieve lots of files. NICMOS coronagraphy, with well-matched template Point Spread Function (PSF) subtraction, probes the closest environments of occulted targets with the highest imaging sensitivity in intrinsically high contrast fields at the smallest radial distances afforded, uniquely, by HST. NICMOS PSF-subtracted coronagraphy has been invoked in a wide variety of HST programs with science themes as divergent as detecting and characterizing disks of circumstellar material in neo-natal stellar environments, to studying faint nebulosity associated with luminous active galaxies, to searching for planetary-mass companions in extrasolar planetary systems recently born and in the “stellar graveyard.” The investment in HST time in the execution of these and other NICMOS coronagraphic programs, has met with mixed returns. Stunning successes importantly advancing their fields highlight more frequent, and unfortunately somewhat common, failures arising from highly compromised technically-achievable performance due to the lack of suitable template PSFs required to produce high-fidelity, photometrically robust, high contrast coronagraphic images. To remedy this situation we are undertaking a rigorous, homogeneous, and complete recalibration and analysis of the full archival set of raw NICMOS coronagraphic images (through HST Cycle 15) previously obtained and residing in the MAST to create a Legacy library of template PSFs enabling the recovery of the large body of science otherwise lost. This PSF library and enhanced data recalibration processes, along with generically applicable analysis software we have created, will: (1) critically augment the needs of observational programs reliant on high fidelity PSF subtractions, (2) increase survey yields and improve photometric effcacy, (3) reduce the observing time (HST orbit allocations) otherwise required for near-contemporaneous reference PSF observations, and (4) greatly enrich the yet-unrealized potential of the many NICMOS coronagraphic observations already acquired from the broad spectrum of science programs previously executed. of the five HST coronagraphically augmented science instruments flown since Cycle 1. Residual energy in the non-central region of the stellar (or other point source) PSF, diffracted beyond the 0.3" radius image plane mask of the NICMOS camera 2 coronagraph, may be further reduced by coronagraphic PSF template subtraction (CPSFTS) to reveal much fainter target circumferential light of astronomical origin (e.g., from light-scattering orbiting dusty debris or near-IR emissive giant planets in close angular proximity to much brighter host stars). CPSFTS of the star HD 32297 reveals its circumstellar disk at two spacecraftroll angles, but many PSF subtraction artifacts remain. Coronagraphic starlight supression in combination with flux-density renormalized (scaled) and astrometrically registered CPSFTS can provide per resolution element (resel) to star image contrasts of app. 10-4 at 0.3" , few x 10-6 at 1", and 5 x 10-7 at 2" from the occulted target. (and corresponding, contrast-limited circumstellar surface brightness limits for J ~ 7 star). (d) target (and PSF template) acquisition (decentration) precision. Contemporaneously obtained “reference” PSFs often do not sufciently replicate these (a-d) variability phase spaces to enable effcacious PSF subtraction. Additionally, the instrumental calibration of the target and PSF template imaging data must be carried out with extreme rigor (beyond what the OPUS pipeline typically delivers) to remove low-level instrumental signatures that can otherwise be conflated with (or mistaken for) true features in PSF subtracted imaging data. Such calibrations are also needed for “roll subtractions” (a strategy for faint companion detection; e.g., Lowrance et al. 2005) where the target is used as its own PSF by observing at two or more celestial orientation (roll) angles. 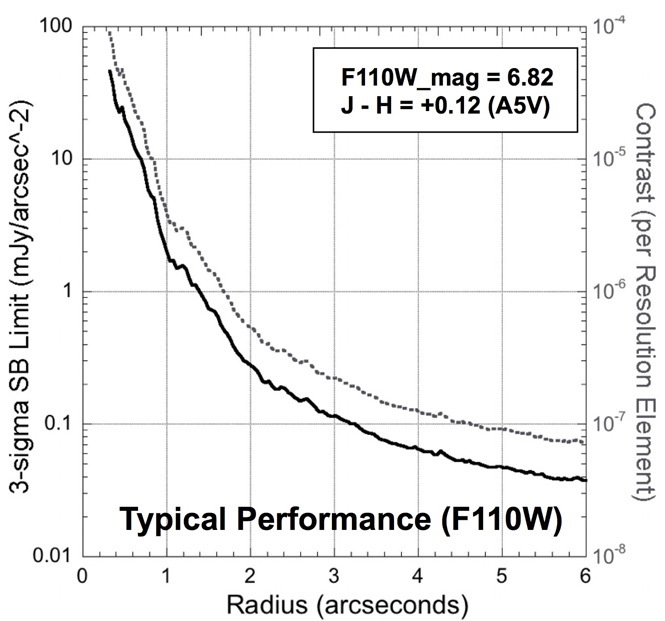 1) the BEST calibrated basic data available for NICMOS coronagraphic imaging. NICMOS raw archival data reprocessed from the Multi-mission Archive at Space Telescope (MAST). 3) these data and augmenting analysis S/W to the community as made available through STScI and the MAST. * At this time we have done so for all NICMOS coronagraphy conducted furing the solid cryogen era of operations (with the camera 2 detector operating at ~ 60K). Template PSFs subtracted from target images that are imperfectly matched in their structural details produce artifacts in difference images that impede unambiguous interpretation and hinder accurate photometry. The principle causes simultaneously contributing to diversities in PSF structures and CPSFTS artifacts are generally not observationally controllable, but with the underlying causalities understood “well matched” PSF templates may be found from ensemble LAPL reprocessed images to attack the problem. Due to chromatic, breathing, cenntering, and cold-mask mis-alignmn et effects , CPSFTS images exhibit a large diversity in image quality and unmitigated optical artifatcs. Here, with images (from upper right to lower left) ordered in increasing J–H color in th etemplate stars, the HD 181327 (J–H = +0.22) debris ring is well revealed in only a few images (outlined in grees, but obliterated in many more (e.g., the few highlighted in red). [CLICK IMAGE to see at 2x scale]. Image artifacts on many spatial scales are produced in target minus template PSF subtractions where the point-source (e.g. stellar photospheric) filter-band SEDs are not identical, even when the in-band flux densities have been perfectly scaled and the images astrometrically co-aligned with appropriate rigor. This chromatic problem is obviated with two- or multi-roll PSF subtractions for point-source detections but, generally, this observation strategy is inapplicable for imaging spatially extended structures such as circumstellar disks. Even in this case, however, other causal mechanisms can be the “tall pole” resulting in PSF mis-matches even when using the target (in roll subtractions) as its own template. For this reason even point-source (e.g., planet-finding) detection programs conducted in this manner will benefit from the LAPL. Many observers had programmed PSF star observations of “similar” colors to their target stars for circumstellar or AGN studies, but many were not su_ciently close in color (particularly under the broad NICMOS F110W and F160W filters) due to other observational or operational selection constraints. The LAPL data products provide J, H, and Ks flux data (and thus J–H and H–Ks color indicies) on all targets, mostly derived from 2MASS and transformed through spectral templates into the NICMOS filter band used for each observation. With that, as a proxy to full in-band spectra for science targets and candidate templates, the LAPL can be searched for candidate PSF templates “well matched” in color and of suffcient brightness. Four principle causes for target:template mis-matches in PSF structures give rise to image artifacts in PSF subtracted images over a large range of spatial scales. Above we illustrate the effect of chromaticity (over a 7" FOV centered on the target). Below image decentration, breathing, and cold mask motions. The large pool of candidate PSF templates provided by the LAPL that, as an ensamble, tiles these parameter spaces, enables PSF subtraction that is otherwise compromised; e.g., see above CPSFTS image example suite for HD 181327. The NICMOS flight software in concert with the HST Pointing Control System is responsible for locating, acquiring, and centering coronagraphic targets at the “sweet spot” of the corongraphic optics. Generally, this is accomplished (per a level 3 instrument requirement met) to a precision of appx 1/8 pixel (~ 10 mas) RSX for most target acquisitions. The LAPL data products carry with them the location of the target obscured in the coronagraph to a typical precison of appx 1/100th pixel RSX, predicated upon target acquisition image centroids and spacecraft (target recentering) slew data telemetered with the embedded downlinked engineering telemetry. This information can be used for target:template image alignment before resampling and PSF subtraction, automatically with the LAPL enhanced IDP3 (Stobie & Ferro 2006) S/W we provide, mitigating the first-order effects of differential mis-centerings with post-facto image processing. However, acqusition decentration at these levels alters the detailed intrinsic structure of the coronagraphic PSF in both the residual diffractive and instrumental scattering components in the halo of the PSF, leaving artifacts due to differential mis-centerings after subtraction. 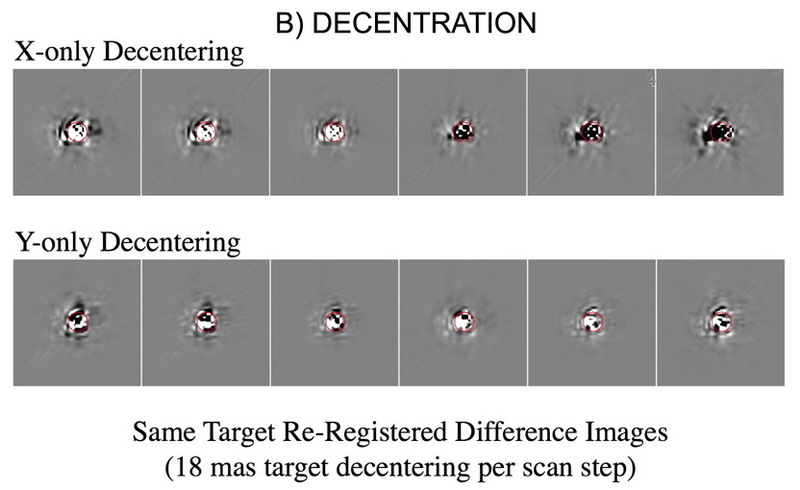 Target:template images obtained with small differential miscenterings minimize these residual artifacts, as evidenced through exploration using down-selected PSF candidate observations from the LAPL. Metrological instabilities in the HST Optical Telescope Assembly (OTA) induce orbit-phase and pointing dependent differential waveront errors (WFE; primarily in focus) arising from despacing (“breathing”) of the secondary mirror (Suchkov & Hershey 1998 (PDF); Hershey 2000 (PDF)), that changes the structure of PSF (Makidon et al. 2006). These changes in PSF structure act on both intra- and inter- orbit timescales and induce residual artifacts in CPSFTS. The WFE-correlated “breathing” phase and amplitude of PSF variations are generally not controllable by observation design. The LAPL candidate PSF templates, as an ensamble, stochastically tile the OTA breathing phase spaces and provides “breathing matched” coronagraphic template PSFs to subtract from similarly breathing-affected science images. To enable high fidelity PSF subtraction using the LAPL, we are undertaking a rigorous reprocessing of ~ 8,800 raw science data images obtained in 45 NICMOS coronagraphic programs* executed in Cycles 7, 7N, 11-15. 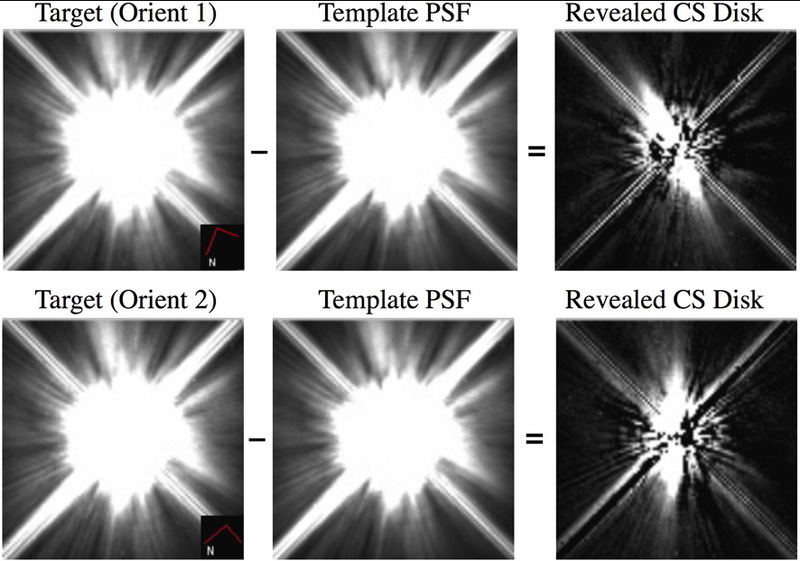 The LAPL recalibration of these high dynamic range science target and PSF template observations (including also supplemental non-coronagraphic imaging obtained in some of these programs) improve the photometric efficacy and image quality over the OPUS pipeline and comprise the LAPL. * NCS era (Cycles 11-16): 8079, 8979, 8983, 8984, 9693, 9768, 9834, 9845, 10147, 10167, 10176, 10177, 10228, 10244, 10448, 10464, 10519, 10527, 10540, 10560, 10599, 10847, 10849, 10852. The two-dimensional dark structure in NICMOS science data readouts depends not only upon the integration time and details of how the detector is clocked (i.e., what “sample sequence” is used) with multiple non-destructive readouts, but also upon the detector bias voltage sourced by electronics far removed from the focal plane array (FPA), and the temperature at which the device is operating. Changes in temperature due to self-thermalization with the operation of the FPA readout amplifiers, instabilities from other sources, and secular drift over time during the SN2 and NCS eras, altered both the dark current and also other image artifact structures. The OPUS pipleine synthesizes model dark frames characterized from (often sparse) on-orbit calibration data to reduce these instrumental signatures, but sometimes fails to sufficiently mitigate zero-point (DC or bias) offsets, amplified flat- field imprints and other artifacts. Such artifacts are often apparent in OPUS calibrated images and, differentially (with non-repeatabilities), become very prominent in difference (PSF subtracted) images. To mitigate this problem, whenever possible, we cull from the totality of all available on-orbit dark frames (of the same sample sequences), matched in detector temperature by ~ 100mK in Cy 7/7N and ~ 50 mK in Cy 11 - 16 to create a dark calibration reference frame for every science image to be calibrated. We provide these calibration reference dark frames in the LAPL along with the science image data products. In some cases where suitable on-orbit dark data are unavailable (notably for some sample sequences at some epochs in Cycles 11-16) we rely as well on model darks, but in other circumstances significant improvements in dark calibrations are realized. One of the major strengths of the NICMOS coronagraph is its ability to push to inner working angles as small as 0.3" (the angular size of its image plane obscuration, aka the coronagraphic “hole”, projected onto the camera 2 detector) from an occulted target. Because of metrological instabilities in the NICMOS dewar system, the location of the obscuration (and targets acquired into it) projected on the detector focal plane can vary by several pixels on time scales of days to weeks. (While these motions are typically < 2 pixels, the photometric reach is greater with a vignetting signature extending ~ 0.5" from the obscuration edge as it is slightly afocal w.r.t. the HST OTA f/24 focal plane). This is not an issue for coronagraphic centering and acquisition on orbit or sub-orbit timescales, but is fundamentally incompatible with STScI’s flat field calibration program that obtains data on monthly to (for many filters) as long as multi-year time scales. 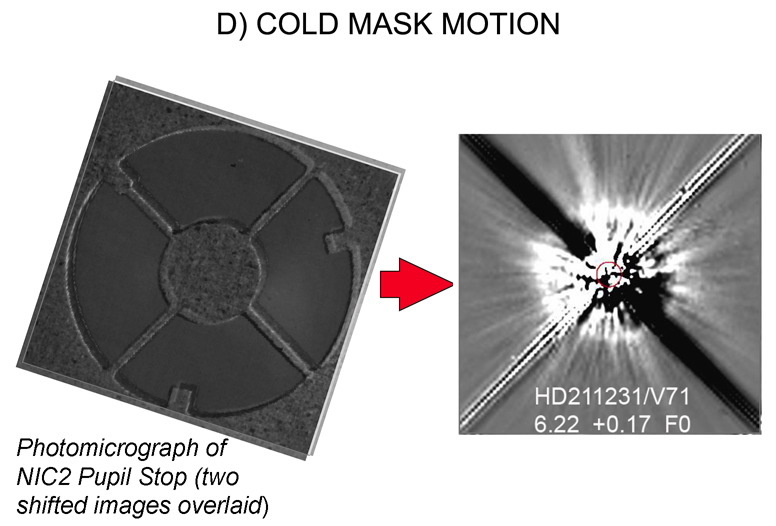 The high SNR camera 2 flat field reference files, available through CDBS and used by OPUS, have static imprints of the corongraphic hole that often do not match its location when science (and PSF) observations were made. While applicable elsewhere in the FOV, mis-registered hole imprints create image artifacts when these flats are used for calibration that are deliterious to imaging at small coronagraphic IWAs. To mitigate this problem we create contemporaneous flat field reference files for every coronagraphic observation, derived from “hole finding flats” that are autonomously acquired as part of the target acquisition process. (Because of the coronagraphic hole motion over time, it is necessary to locate its position on the detector focal plane through internal flat field observations analyzed by the on-board flight S/W. These acquisition support images are downlinked with the science data images and are used advantageously in LAPL reprocessing.) Hole finding flats are always taken in only the F160W filter, and thus we perform a pixel-by-pixel detector-temperature dependent band-transformation to the science data filter band based upon the instrumental calibration to create contemporaneous flats to match each science observation. These flats remove the “hole imprint” artifacts induced by the use of CDBS flats in the OPUS pipeline. LAPL calibrated science data images named *_clc_cal.fits and *_clc_calf.fist use these observation-matched contemporaneous flats in calibration that we also provide in the LAPL. 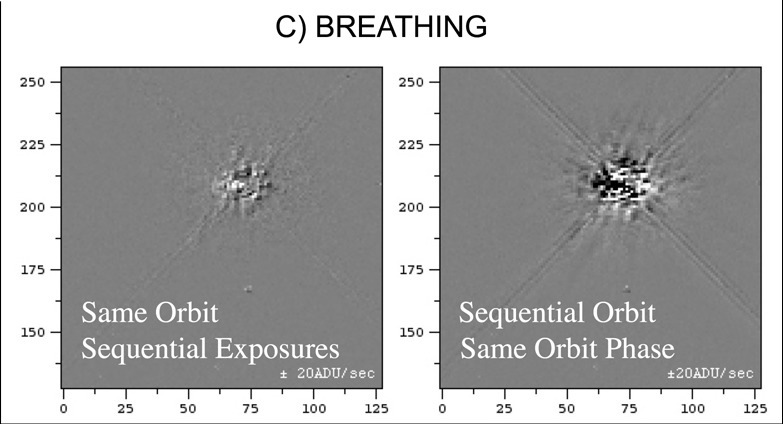 Two PSF-subtracted images of RY Tau (using the same PSF template) obtained in the same spacecraft orbit but at field orientations differing by 30° as flat-fielded by the OPUS pipeline exhibit nearly identical rotationally invariant bright spots exterior to the r=0.3 coronagraphic hole, belying an instrumental origin. Middle: Multiplying the contemporaneous (unity normalized) “hole finding” with the CDBS reference flat used in the OPUS pipeline calibration reveals a misplaced imprint of the coronagraphic hole (detailed in the right panel). Red circle is the location of the coronagraphic hole at the epoch of the science observation, it’s (opposite parity) imprint in the CDBS flat is displaced by about half an arcsecond. Color scale in the linear stretch indicates photometric multiplicative error factors which arise using the OPUS calibrated image. The target acquisition “hole finding flats” are exposed to a per-pixel SNR ~ 50, as opposed to several hundred to ~ 1200 in the medium or broad band filter calibration reference flats created by STScI that reside in the CDBS and used by OPUS. Except in the regions (generally of greatest interest in coronagraphic programs) near the coronagraphic obscuration, the CDBS flats would be superior to use. However, secular changes in the flat-field response in different filters (separately within the SN2 and NCS eras of operations) have been noted that result in photometric errors after flat-fielding. For each filter we have re-examined all available on-orbit internal flats to assess field (detector location) dependent variations in sensitivity (photometric response) with both time and temperature. From this we create, by exposure binning and/or interpolation as is appropriate, an“epochal” flat field calibration reference file for every science data image that is also used to produce a LAPL calibrated image (with file names *_cle_cal.fits and *_cle_calf.fits) applicable everywhere in the FOV except close to the coronagraphic obscuration for reasons discussed above. Thus, the LAPL provides two calibrated data images for each exposure, separately, with hole-edge artifact rejection using lower SNR flats, and higher precision photometry at angular distances unaffected by the presence of the coronagraphic hole. The LAPL does not synthesize these into a single image, as the applicability for one over the other depends upon the metrical needs (and goals) of any particular investigation. The OPUS pipeline uses static “bad” pixel maps to identify defective or inoperable pixels. Pixels that are deemed as bad, by adopted criteria, are left uncalibrated in the calnica pipeline process (and those pixel values set to zero). The criteria used in the STScI OPUS pipleline to identify “hot” pixels (with excessively high dark current) or under-responsive pixels (possibly by shadowing from contaminants on the detectors themselves) are very conservatively set – appropriate for very faint object imaging in sparse fields and where image dithering is a viable strategy for recovery. These criteria, however, are not so well suited for high dynamic range imaging where the target region of interest is filled with bright flux and dithering (with coronagraphy) is not a viable observation technique. Hence, in LAPL processing we developed and applied static bad pixel maps (separately for the SN2 and NCS eras) with identification criteria specifically applicable to bright object coronagraphy. In particular, we define a pixel as hot if it contributes noise from dark current in 64 seconds that is more than half the read noise. With this criteria the static number of excessively hot pixels during the SN2 era excluded from LAPL calibration was 36 and during the NCS era was 196. Excessively under-responsive pixels were evaluated from F222M internal flat field lamp (and background) exposures defined as < 5 sigma less responsive than the median of good neighbors in a 9x9 pixel box about every pixel. With that criteria we found 143 and 214 pixels uncalibratable due to under-resposnivity in the SN2 and NCS eras, respectively. We document the calibration status (good, dead, saturated, under-responsive, excessively hot, etc.) of every pixel in a data quality (DQ) extension on all LAPL image data products. As in the OPUS pipeline, pixels that are found to be defective, by the criteria summarized above, are not calibrated - but in LAPL processing are “repaired” post-facto. Bad data reparation is required with coronagaphic data that in application for PSF subtraction are (later) digitally re-binned and resampled with template-to-target astrometric alignment; bad pixels if “set to zero” (as in the OPUS pipeline) would adversely affect a ring of neighbors when resampled. Uncalibratable pixel values are estimated by two-dimensional Gaussian-weighted bi-cubic interpolation of good neighbors, using sinc-function apodization with a kernel width matched to the FWHM of the bandpass employed for the observation (to suppress interpolative “ringing”, particularly if undersampling the PSF which is the case in the F110W filter in camera 2). LAPL data products which carry the name * calf have had uncalibratable pixel values estimated in this manner. While no bad (zero) pixel values appear in the LAPL * calf files, the DQ extensions reflect the state of the pre-repaired pixels, so investigators can know which pixel values have been estimated rather than directly measured. Example of LAPL “bad pixel” reparation (see main text; log10 image displays). Left: Pixels in black are defective and uncalibratable by the cirteria adopted for the LAPL. Right: The same image after repairing uncalibratable pixels. To assist LAPL archival users in finding candidate NICMOS coronagraphic PSFs templates potentially suitable for their science targets of interest, we have attached a number of qualifying, descriptive, and metrical FITS file header keywords and corresponding values to characterize every image (with a recommendation to STScI that these be ingested into a meta-databse in the MAST to facilitate data searches). We summarize these in Tables 1 and 2. We also have augmented, and make available through STScI, the IDL-based IDP3 image analysis S/W with added functionality to enable and enhance interactive exploration and quantitative data analysis of PSF subtractions using large image ensembles derived from the LAPL (and other sources). Table 1: Observation Description FITS Header Keywords. Table 2: Target Location and Photometry FITS Header Keywords. Many NICMOS coronagraphic science programs have reported negative results in source detections that are (now) attributable to the lack of suitable template PSFs as remedied by the LAPL. 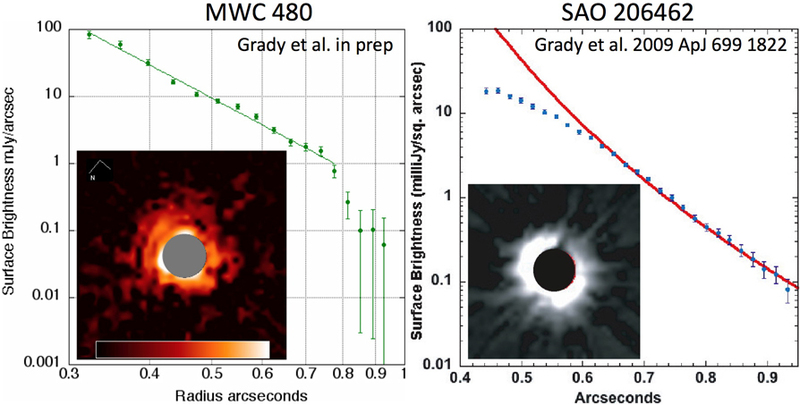 While yet to be systematically applied across the diversity of target classes, during the LAPL development a number of previously published “non detections” were revisited and turned into spatially resolved and photometrically reliable analysis quality data images with LAPL processing methods and PSF templates; for example the cases of the sub-arcsecond transition disks around the PMS stars MWC 480 and SAO 206462 shown below. scattered-light detections of circumstellar disks associated with two of those stars were reported by Augereau et al. 2001, but with a suitable PSF template ensemble and LAPL reprocessing those disks were recently imaged and photometric surface brightness profiles measured. The same observing program succeeded in detecting the brighter, and larger (so less contrast challenging) circumstellar disk about the PMS star HD 100546. With LAPL reprocessing and PSF template subtraction the improvement in image data quality will allow re-interpertation of these data with the image artifacts earlier affecting photometric isophotes now largely mitigated (below, panels A & B). 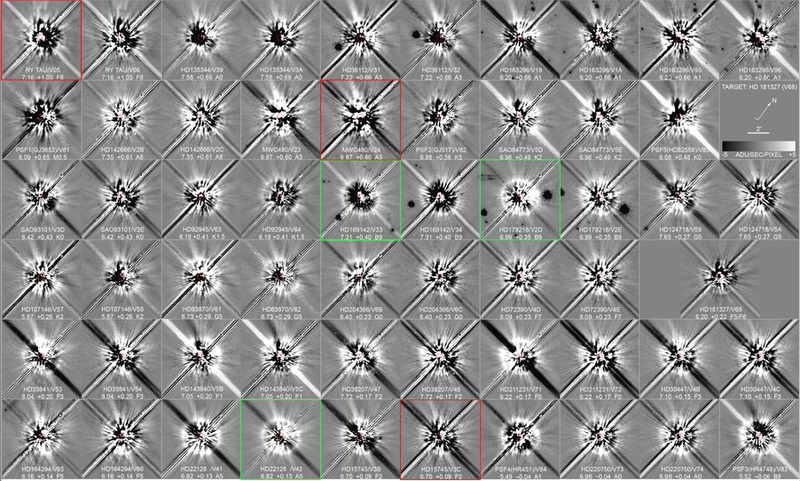 Significant improvements in optically thin debris disk images are also demonstrated with original and LAPL CPSFTS imaging of the HD 181327 debris ring (below, panels C & D), for which the morphology of much more sharply bounded ring edges are now clearly seen. templates. (C) HD 181327 (F110W) as reported by Schneider et al. 2005, (C) with LAPL reprocessing and PSF templates. The NICMOS LAPL to be made publicaly available through the MAST along with image analysis tools in the IDL/IDP3 environment responsive to LAPL data keywords will enable archival science investigations levering the large investment in orbits devoted to NICMOS coronagraphy with new results previously unobtainable. Good hunting!